The worst single loss of life in the history of the Fire Brigade occurred during the night of the 19th when 34 firemen were killed at the Old Place School in Poplar, East London. Locally high explosive bombs completely demolished the end of Cranworth Gardens and properties in the centre of Hillyard Street. Notes Fire extinguished by SF.P. No further report. 19.04.41 21:53 Express Report at Hillyard Street between Brixton Road & Clapham Road. Fire. 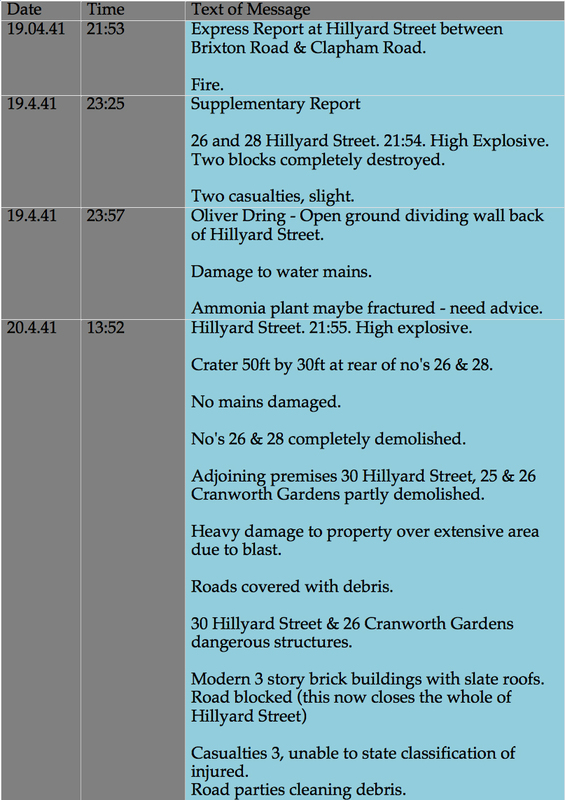 19.4.41 23:25 Supplementary Report 26 and 28 Hillyard Street. 21:54. High Explosive. 19.4.41 23:57 Oliver Dring - Open ground dividing wall back of Hillyard Street. Ammonia plant maybe fractured - need advice. 20.4.41 13:52 Hillyard Street. 21:55. High explosive. Crater 50ft by 30ft at rear of no's 26 & 28. No's 26 & 28 completely demolished. Adjoining premises 30 Hillyard Street, 25 & 26 Cranworth Gardens partly demolished. Heavy damage to property over extensive area due to blast. Roads covered with debris. 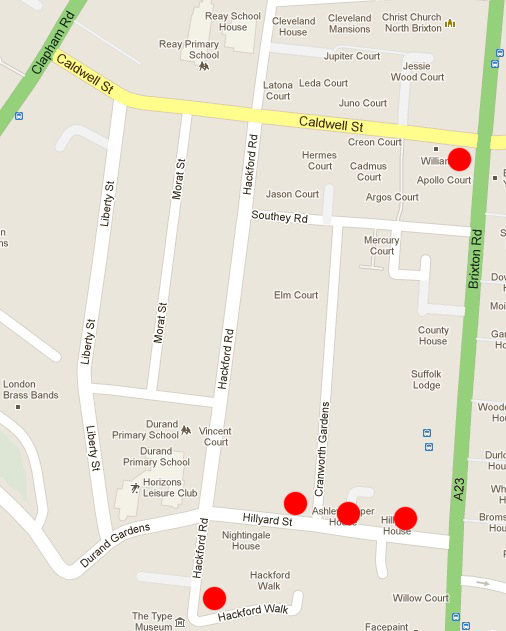 30 Hillyard Street & 26 Cranworth Gardens dangerous structures. Modern 3 story brick buildings with slate roofs. Casualties 3, unable to state classification of injured. 20.4.41 16:18 17 Cranworth Gardens - 21:54. Damage to building caused by blast from Hillyard Street. Front walls affected. Casualties - slight. Since the first supplementary has been sent, it has been definitely ascertained that the damage was caused by blast from Hillyard Street. 19.04.41 22:26 PM Express Report Casualties at - The Russell Hotel. Fire. 21.4.41 8:47 AM Cuisine 1909 Ltd (Oliver Dring's) 119 -123 Hackford Road. Will you please allow the R.S.D to shore up part of collapsed roof to enable essential food producation machines to be removed to an adjoining department. Also recover rice under debris so that the firm can continue work this morning. Please treat this matter as urgent. 20.4.41 12:31 AM Cuisine 1909 Ltd 119 -123 Hackford Road. 21:54 - High Explosive. Crater 30ft by 15 ft. Bomb fell on sausage manufacturing department (single storey building) demolishing roof and side walls of factory, burying a chopping machine and a filling machine but apparently these are not badly damaged and if removed from debris can be used again. Ammonia feed plant damaged from cut out and considerable damage done to surrounding buildings by blast. 8 service M.G's damaged. Employees are clearing up light debris and salvaging M G's. If they can be spared two R.S parties could be used to salvage the two machines referred to above and so enable production to continue. 24.4.41 05:51 Oliver Drings Hackford Road. Strong smell of escaping gas.